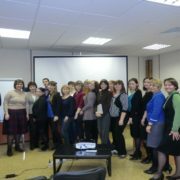 From 1 to 3 April 2015 DevStat organized a workshop on statistical business registers for Russian specialists. This workshop took place at the Federal Statistics Service of Russia (Rosstat) and dealt with questions related to the creation and use of the statistical business register, the identification of statistical units and its access by different types of users. The workshop is part of the technical assistance that DevStat provides to Rosstat for the improvement of business statistics.